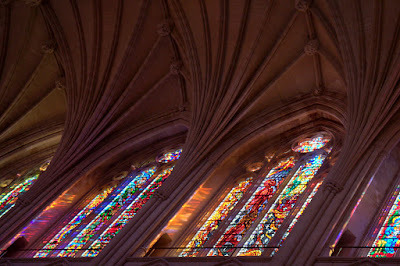 Colors stream from the clerestory windows at the National Cathedral in Washington DC. The massive vaults support a ceiling 100 feet over the isle of the naive. Canon 40D, 1/25s at f/2.8, ISO 800, 57mm effective focal length. View more of the pictures from our visit to the National Cathedral.